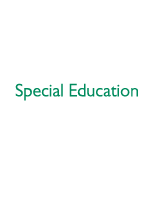 Learn how to support students with special needs and provide access to the curriculum. These sessions focus on teaching students with social, emotional, academic, or physical disabilities. Topics include special education leadership, the power of co-teaching, and Response to Intervention (RtI). Explore Universal Design for Learning (UDL), Positive Behavioral Interventions and Supports (PBIS), and Assistive Technology (AT).